Kuna, Idaho real estate attracts home buyers looking for more home affordability than what is comparatively offered in most other areas of Ada County. Homes for sale in Kuna range from starter homes to many acreage and farm properties. Some residents live and work in Kuna while others commute to some of the larger surrounding cities like Meridian and Boise. Located 18 miles SW of Boise, Kuna real estate has more of a rural, small town feel. Kuna, Idaho is home to 15,210 people (1) and has been one of the fastest growing communities in Idaho. In fact, since 1990, Kuna has grown more than 700% from when the population was 1995. "Kuna" means "the end of the trail" (2). The name comes from being at the end of a historic railroad line that came from Boise. Originally, the area was mostly desert. However, as people began to settle in the area they eventually built an irrigation canal (Indian Creek) turning much of the area into productive farm land. Today, the real estate landscape in Kuna looks much different. Farm ground has given way to many subdivisions. While you can still find farm and acreage property, most of the homes for sale in Kuna are located in subdivisions built in the last 10 to 20 years. The American Community Survey completed by the US Census can be a great source of information about a community. Homes for sale in Kuna tend to be newer homes, have more bedrooms, a lower price, and a larger household size than most of the surrounding cities. Most people in Kuna own their homes rather than rent. See below for breakdowns on Kuna, Idaho housing data (3). The Kuna real estate market has approximately 4,557 housing units. Of those homes, the majority were built in the 5 year span of 2000 to 2004 (33.9%). As you can see below, 89.4% of the homes have been built since 1990. This is also reflected in the city's rapid population growth. The figures below also show that the 1980s were a slow period of growth. This was also true for most of the Idaho real estate market. More than half of the homes in Kuna are 3 bedroom homes (51.9%). Compared to all the homes in Idaho, this is about a 10% higher concentration than nearby cities. Kuna also has a high number of 4 bedroom homes (32.2%), only trailing Eagle, Idaho (34.7%) compared to other major Treasure Valley communities. Kuna, Idaho homes have the 3rd lowest median home value compared to the other major Boise-Metro real estate markets. The overall median value was $154,300. 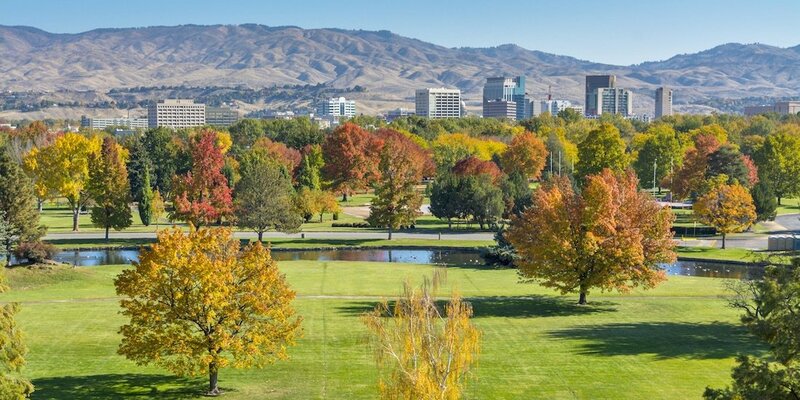 7.7% of the homes in Idaho were valued between $100,000 to $199,999. For owner-occupied homes, the Kuna real estate market has the highest percentage of homes with a mortgage in the Treasure Valley. Within all of Idaho, 68.9% of homes have a mortgage. Kuna, Idaho has a very high rate of owner-occupancy. While some rentals exist (16.4% according to this data), most people living in Kuna own rather than rent. Kuna has the largest average household size for both owners and renters for Ada County. Within Ada County, the average household size is 2.66 for owner-occupied and 2.39 for renter-occupied homes. For Idaho, the average household size is 3.23 (owner) and 2.69 (renter). As shown in the chart below, population growth in Kuna, Idaho was flat until the 1970s when the population nearly tripled from 593 to 1,767 people. Growth slowed again in the 1980s, but started rapidly expanding again in the 1990s when the population more than doubled. From 2000 to 2010, Kuna grew by nearly 300%. This rapid population growth spurred numerous real estate developments over this period. The Kuna Caves - The Kuna Caves were formed from what once was a lava tube. Visitors come to descend into the cave that runs about 50 feet deep and about a quarter-mile north and south from the entrance. Morley Nelson Snake River Birds of Prey - A National Conservation Area (NCA) established by Congress in 1993 to protect the world's densest population of Eagles, Falcons, Hawks, and Owls. The NCA encompasses 485,000 acres and is home to 24 species of birds of prey. Initial Point Butte - One of the most common used methods for land surveying is the Public Land Survey System (PLSS). Most PLSS surveys across the U.S. begin at an "Initial Point". For Idaho, the Initial Point is in Kuna. From the initial point, a north-south line is created called the "Principle Meridian". As you might have guessed, Meridian, Idaho received its name because Idaho's Principle Meridian runs through it. The Silver Trail - In the mid-to-late 1800s, Idaho was booming with mining (4). Both gold and silver brought immigrants in search of their share of the fortunes. Silver was discovered in the Owyhee Mountains, southwest of Kuna, in 1863. The Silver Trail was then constructed as a stagecoach route that connected the booming mining town of Idaho City to Silver City (4). Dedication Point - Dedication Point in Kuna, Idaho offers a spectacular view of the Snake River Canyon. Dedicated parking just off the highway and a maintained 1/4 mile trail provide easy access for visitors to enjoy the canyon views and watch for birds of prey. Swan Falls Dam - Swan Falls Dam was built in 1901 to supply electricity to nearby mining towns, such as Silver City. Swan Falls Dam is the oldest hydroelectric plant on the Snake River and was the first to generate three-phase power (5). The original plant was decommissioned and now serves as a museum. A newer plant replacing it was built in the 1990s. No representation or warranty of any kind is made. User to verify all informaiton. 3) The 2007-2011 American Community Survey completed by the US Census.